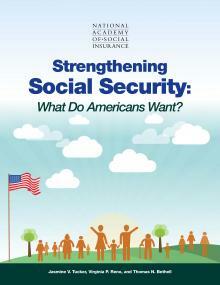 REPORT: Strengthening Social Security: What Do Americans Want? Social Security faces a long-term shortfall. How do Americans want to deal with it? ...raise the retirement age to 68 or 70? ...means test benefits for the well-to-do? ...increase the Social Security tax that all workers and employers pay? ...raise the cap on earnings that are taxed and counted toward Social Security? ...use the chained CPI to produce a slightly lower cost-of living adjustment? ...increase benefits for long-serving low-paid workers? ...increase the COLA to reflect inflation experienced by seniors? ...reinstate student benefits for children of disabled or deceased workers? The study explores Americans’ views on Social Security across generations, income levels, and political party affiliation. Read the press release here.